Major League Baseball has a problem that the other three major sports leagues in this country don’t have to worry about. I’m not talking about steroids or other performance enhancing drugs, (since, let’s be honest, they ALL have that problem.) You see the NFL, NBA, and NHL have all embraced change and progression as their particular league evolves, as well as when technology allows them to. The problem baseball has is the nagging, tired idea of the purist; an unorganized group of people who believe that baseball should never change, and that the game is still as good as it was back in them good ‘ole days. Things such as instant replay on home run calls, or computerized strike zones can never truly get off the ground because of them. They worry about the “integrity of the game.” That is a phrase purists use ad nauseum as their rallying cry against anything that dare to besmirch the grand history of their precious game. It becomes difficult not to imagine them as a group of cranky old men meeting for lunch at a community center and griping about the kids on their block and their dadgum stereos and push-boards. People that think the dead-ball era is a model for how the game should *really* be played. The idea of performance enhancing drugs is almost too much for them to process. As the list of current players reportedly testing positive grows, so to do the complaints of self proclaimed “baseball purists” that not enough is being done to deter players from trying to cheat. Some want to be all dramatic about it and throw them out of the game FOR-EV-ER! Consider it the opposite of sainthood, where there are not enough negative superlatives invented to describe someone so heinous as to take performance enhancing drugs and play baseball. This leads me to the most recently accused, outfielder Ryan Braun. Braun hit .332 with 33 home runs and 111 RBI for the NL Central winning Milwaukee Brewers this season, throwing in 33 stolen bases for good measure. I had a chance to watch more than a few Brewers games this season, and his at bats were can’t miss stuff. He was by far the toughest out in the line up, (though hitting in front of someone like Prince Fielder doesn’t hurt.) For his efforts, Braun was voted the NL’s Most Valuable Player by the Baseball Writer’s Association of America. This also includes winning a Silver Slugger award, and appearing at the All Star game. He helped to usher in a new era of baseball in a mid-western city that was starving for one. 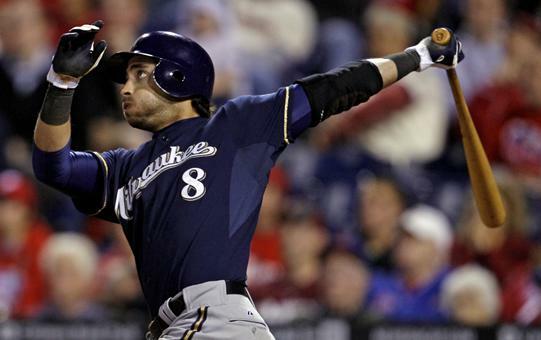 While Braun’s personal ventures have met their share of criticism, on the field he was as good as anyone in the league. All of this is now somewhat smeared, as Braun tested positive for PEDs during the playoffs, where his Brewers made it to the NLCS. He currently faces a minimum 50 game suspension upon the start of the 2012 season. Now, remember how those baseball purists can’t stand players that would even think of taking steroids to enhance their performance? Yeah, well they remembered that Braun won the MVP, and now lead the charge against him keeping it. There is increasing call for the Writer’s Association to strip Braun of his award. This argument has come in a few forms. Some call for a complete re-vote, others think they should simply vote yes or no if he should keep it, while some just think it should be given to the guy who came in second place (Los Angeles’ Matt Kemp.) It’s about the integrity of the game, damnit! NOT *MY* MVP! While it seems the BBWAA has no intentions of taking the award back, the outrage continues. Here is where the contradiction of “baseball purists” is put to the test. You see, there is ZERO precedent for something like this occurring in the MLB. There were no re-votes for any of Barry Bonds‘, Alex Rodriguez’s, Jose Canseco’s, or Ken Caminiti’s MVP awards, and those are all players that had admitted to doing the PEDs during those seasons! Now, rules are rules. If Braun tested positive, and his appeal is denied, then he will have to sit out the 50 games like anyone else would. While I do not personally care at all whether players are using PEDs or not, rules are rules. I am just trying to point out that people don’t seem to be realizing that in this situation you cannot have your cake and eat it too. To take something away from Ryan Braun because he cheated makes sense, doesn’t it? To take something away from Ryan Braun because he cheated, but to not take away similar awards from players guilty of the exact same thing does not. They’re only looking for change when it benefits them, and their agenda of making sure things go back to how baseball was in the 1920’s. Also try to ignore the ridiculous notion of throwing out all the existing records if the player is eventually found guilty. Hindsight is 20/20. Do not change history because it doesn’t suit your new moral complex about steroids. That idea is no more radical than asking entire teams to give up post season victories, and that is almost universally agreed as being a silly thing to do. Braun would have never won the award if he tested positive during the regular season. He didn’t. Let the man keep his award, and if he is guilty, he’ll serve his suspension and get on with his career. Milwaukee’s in enough trouble losing him for 50 games and likely Fielder permanently to a conference rival. People think taking steroids suddenly makes you this wonderful baseball player with all sorts of new abilities, and home run power. If you think that’s true, look at the dozens of minor leaguers and journeymen that test positive and explain that. Braun’s natural ability will now forever be questioned. He’s going to hear it at every game he plays for the rest of his career most likely. He’s a smart guy, he knows he did wrong. Let him keep his MVP award as a reminder of how quickly it can all change.